Goalkeeper Scott Loach has joined Posh on loan from Rotherham. Photo: Joe Dent/theposh.com. New Peterborough United goalkeeper Scott Loach hopes to kick start his career at The ABAX Stadium. Loach moved to Posh on loan, initially for a month, from Rotherham United yesterday (January 15) as cover for Ben Alwnick who faces time on the sidelines with a thigh injury. Loach is just 26, but already a veteran of almost 250 career appearances. He started his career at Watford before moving to Ipswich and the Rotherham last summer. He has started just four games for ‘The Millers’ this season and was sent out on loan to League Two side Bury earlier this season. “I jumped at the chance to come to Peterborough,” Loach insisted. “I’ve been in and around Championship sides for most of my career, but you can’t beat playing regularly. “My career has stalled a little bit this season so this is a great opportunity to show people what I can still do. “I’m only 26 and if someone had said I would have played so many games at this stage of my career I’d have bitten their hand off. I want to kick on again now though. I want to keep playing until my body can’t move any more. “I’m looking forward to working with the lads and the manager. 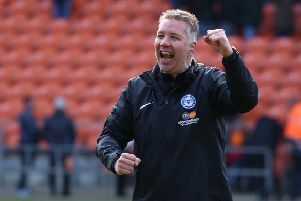 I’ve played with Lee Frecklington and Paul Taylor this season and they spoke highly of Darren Ferguson. “I’ve always enjoyed my games at Peterborough. It’s an old school ground with a good atmosphere so I’m hoping to have a good month here. Loach played 14 times for England Under 21s when Joe Lewis was his main rival for the goalkeeper’s spot, Loach has also been included in three senior England squads.